The well-established company combines for the multifunctional jacket a functional textile with a high-quality heating, communication and lighting system. 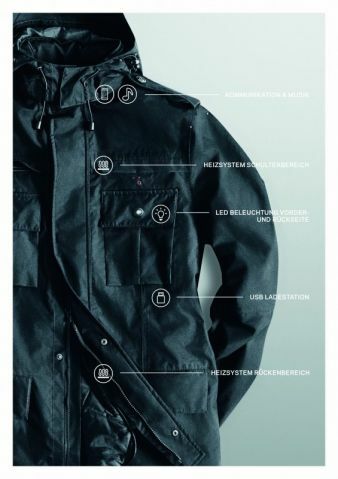 The basis of the functional jacket is the “guaranteed green” Sympatex membrane, a product of the affiliate Sympatex Technologies GmbH, which is processed with a carrier material to an application-specific laminate. The advantage is 100% waterproof and windproof as well as optimally breathable. The jacket is heatable in two separate zones, in the shoulder area and in the back and kidney area, where the heating system can be switched on and off with control buttons on the front of the jacket. The communication system can be used at the same time, using the power button. Via a Bluetooth connection, calls can be accepted or rejected and stored music can be listened. Two loudspeakers and a microphone are integrated into the collar. For the lighting System white lights are attached at the front of the jacket. They offer better orientation and work like a torch. Thanks to red lights at the back of the jacket, you will also be noticed easier on the road. The system works with a chargeable separate battery.